FORMER Queensland Premier Mike Ahern has paid tribute to his successor Wayne Goss following news of his death at age 63. Mr Ahern said Mr Goss was an honest parliamentarian who did his work 'very thoroughly' in implementing tough reforms following the Fitzgerald Inquiry into police corruption. Mr Goss had shouldered the 'heavy burden' of the reform process which was 'not popular' with some within power in Queensland. "The people of Queensland can be grateful for that. Mr Ahern himself lost the leadership of the National Party after he vowed to implement the Fitzgerald Inquiry recommendations "lock, stock and barrel''. Mr Ahern said Mr Goss' recent battles with brain tumours had been particularly hard on him and his family. His most recent tumour has left with a speech impediment. "That was a hard cross for him to bear,'' Mr Ahern said. Mr Ahern said he and Mr Goss used to meet at lunches after both being given honorary doctorates by the Queensland University of Technology. WAYNE Goss has been remembered as a reformer who changed Queensland politics. Mr Goss, 63, was the first Labor Premier after three decades of the National Party dominating Queensland politics was responsible for instituting a range of Fitzgerald Inquiry recommendations. Mr Goss had been battling brain tumours for 17 years. Born in Mundubbera, west of Maryborough, Mr Goss was raised in Inala, a western-Brisbane suburb, before studying law at the University of Queensland. He worked for the Aboriginal Legal Service and in private practice before entering politics. Mr Goss was elected premier in 1989 after 32 of the Coalition dominating Queensland Parliament. 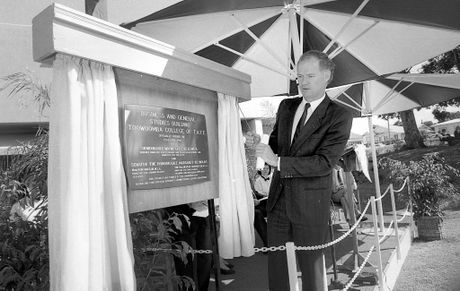 After defeating short-lived National Premier Russell Cooper in 1989, Mr Goss instituted Fitzgerald Inquiry recommended reforms. Mr Goss decriminalised homosexuality and dismantled the "Bjelkemander" system - which overrepresented National and Liberal areas. Queensland Labor Party leader Annastacia Palaszcuk said Mr Goss would be remembered as "one of the great Premiers of our state". "Not only did he lead the Labor Party back into government in 1989 after 32 years in the wilderness, he led a government that changed forever the face of our state and the expectations of Queenslanders," she said. "His initiatives in areas such as education, health, the environment, and accountability set new and higher standards for our state." In a joint statement, wife Roisin Goss, and children Ryan and Caitlin said Mr Goss loved Queensland and had been proud to work for it. "As a family we mourn the man we love; as Queenslanders we join with so many others in gratitude for everything Wayne did for our community and our state," it read. "We and the extended family are immensely thankful to Dr Bruce Hall and all of Wayne's medical team for their excellent care, and to all those who have sent their well wishes during Wayne's illness." Queensland Premier Campbell Newman has expressed his condolences at the passing of former Premier Wayne Goss. "I was saddened by the news this morning," Mr Newman said. "It came as Cabinet was meeting, and the loss was very much brought home to all of us. "My Cabinet colleagues, along with the Directors-General who were in the room, immediately observed a minute's silence. "I telephoned Roisin to offer my and Lisa's condolences. "Wayne was a true leader who guided his party and the State through a turbulent time in Queensland's history. "He drove much-needed reform in many aspects of Queensland's public life, including social policy, electoral laws and reform of the police service and broader public service. "He did so with tenacity, determination and courage. "Those attributes were also very much at the forefront as he battled cancer. "I'm saddened he should have lost that fight at such a young age. "Our thoughts are with Roisin, Ryan, Caitlin and all their families." Premier Newman has offered the family a state funeral. 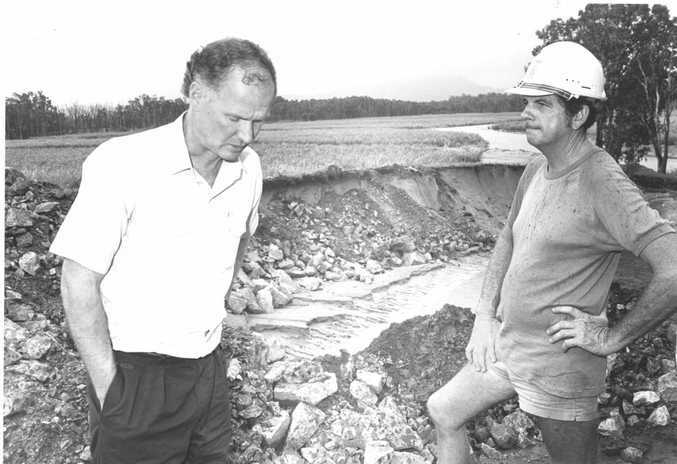 Premier Mr Wayne Goss visiting Mackay during The Big Wet of 1990/91 and spoke with canegrower Ray Geisler in late December. 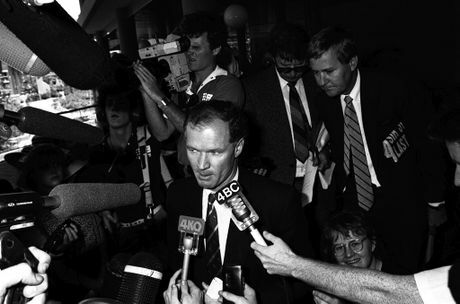 FORMER Queensland premier Wayne Goss has died aged 63. Goss family spokesman Russ Morgan confirmed his death this morning, the ABC reported. In 1989, Mr Goss became the first Labor premier after many years of National Party rule. He lost government in 1996. Several years later, he was diagnosed with a brain tumour and has underwent regular treatment since then. Former Labor minister Robert Schwarten said Mr Goss died overnight, Fairfax reported. Mr Schwarten, who was a backbencher in the Goss government, said the former premier had been in poor health in recent years. He is survived by his wife Roisin and two adult children Ryan and Caitlin. Mr Goss, whose former chief of staff was Kevin Rudd, underwent at least four operations for brain tumours over 17 years. Mr Goss, who grew up at Inala, before becoming a solicitor, did not become a member of the Australian Labor Party until the dismissal of Gough Whitlam in November 1975. He entered state politics as an Australian Labor Party (ALP) MLA in 1983 for the electoral district of Salisbury and, from 1986 onwards, for Logan. He was elected Leader of the Opposition in March 1988. He led Labor into the 1989 state election against the National Party government of Russell Cooper when the Nationals were still reeling from revelations of the rampant corruption of long-time premier Joh Bjelke-Petersen. 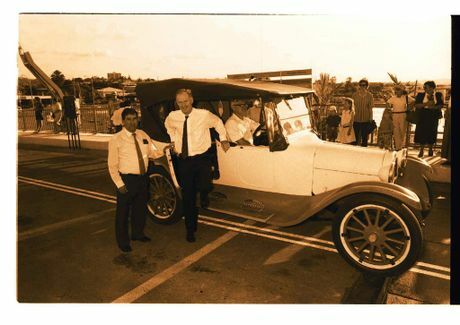 Sir Joh Bjelke-Petersen's immediate successor, Mike Ahern, a Sunshine Coast MP, had been toppled in a party-room coup just two months before the election and replaced by Cooper. Mr Goss seized on National ads arguing that his plans to decriminalise homosexuality would result in gays flooding into Queensland. Labor won a strong majority government at the 1989 election, scoring a 24-seat swing, the worst defeat of a sitting government up until that time in Queensland. Mr Goss presided over the implementation of many of the reforms of the landmark Fitzgerald Inquiry into police corruption. The Goss Government introduced several electoral reforms, the most notable being the elimination of the "Bjelkemander" gerrymander that had helped keep the Queensland Nationals in power. In addition to reforming the state's electoral laws and boundaries, the Goss Government "introduced merit-based appointments to the Queensland public service and created new National Parks. It also introduced social reforms such as decriminalising homosexuality, appointing Queensland's first female minister in cabinet and first female Governor, abolishing the Queensland Police Special Branch and Imperial honours. Goss' chief of staff as Premier was former diplomat Kevin Rudd, later leader of the federal Labor Party and Prime Minister of Australia, and Goss' 1989 campaign director was Wayne Swan, subsequently Deputy Prime Minister. After resigning as Premier and Leader of the Labor Party on 19 February 1996, Goss returned to the back benches of the Opposition under new Opposition Leader Peter Beattie and assumed something of an "elder statesman" role. However, a diagnosis of a brain tumour (subsequently partially removed without any problems) forced him to scale back his activities. Mr Goss retired from politics at the 1998 Queensland state election. Mr Goss was also awarded honorary doctorates by QUT and Griffith University. In business, he served as National Chairman of the Australian section of Deloitte from 2005-2013, as well as chairing numerous other firms. The former Queensland Premier also chaired FreeTV Australia, the lobby group representing the free-to-air television companies in Australia, from 2008 until 2011.